3D-printed taillights reduced the Bugatti Divo supercar’s weight. Automakers and suppliers have been talking up 3D printing in recent years, but with little to show for it in production vehicles. That's about to change as 3D printing, or additive manufacturing, inspires new confidence among producers. The taillights on the Bugatti Divo offer an example. The Divo supercar, with its $5.8 million starting price, was one of the stars of last summer's Monterey Car Week. 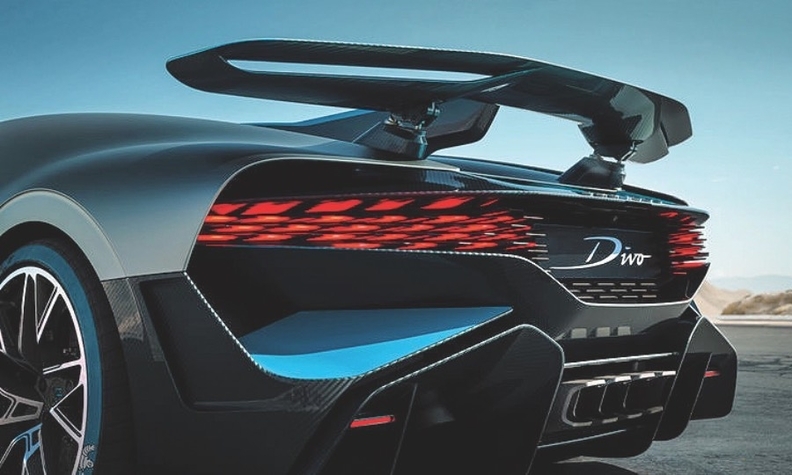 It achieved a 77-pound weight reduction from the Bugatti Chiron on which it is based, with some coming from more precisely made 3D printed taillights. The lights are in the rear grille, which was partly produced via 3D printing. The taillight portion is made up of 44 lightweight fins. At the edges, the fins are wider, creating a more intensive light. At the center, the fins are narrower. Bugatti is looking for other uses for the technology. Last year, it revealed that it has worked with tech suppliers Bionic Production and Fraunhofer IAPT to develop an eight-piston, titanium monobloc brake caliper via 3D printing. Bugatti says that part is being prepared for series production. Other automakers are also getting deeper into the technology. For instance, Ford Motor Co.'s redesigned Mustang Shelby GT500 is fitted with two 3D printed brake parts. Those parts are made at a new manufacturing center in Detroit, where the automaker is working with 10 3D printing companies and using 23 3D printers.